The Friday Dress is finally here! It only took me two years. Hopefully, I've got my act together and you won't have to wait that long again for a pattern. This is the last pattern I will be releasing this year... just in time for the holidays! However, be sure to come back tomorrow to see what I have planned for the new year! I know I am excited too! Now about the Friday Dress... it's a dress with timeless silhouette that works for every girl, from active toddler to chic tween. You can really make it retro or classic, dress is up or down. It's perfect for twirling or hair flipping... going to a party or even just the park. Below you will see all the options it comes with- add a patch pocket, make it long or short sleeve. The back has some fun details too, gathered for a feminine touch or pleated for a classic look. There are so many possibilities that you can make this dress over and over and it will never look the same. Below is Option D with the gathered back and round collar. 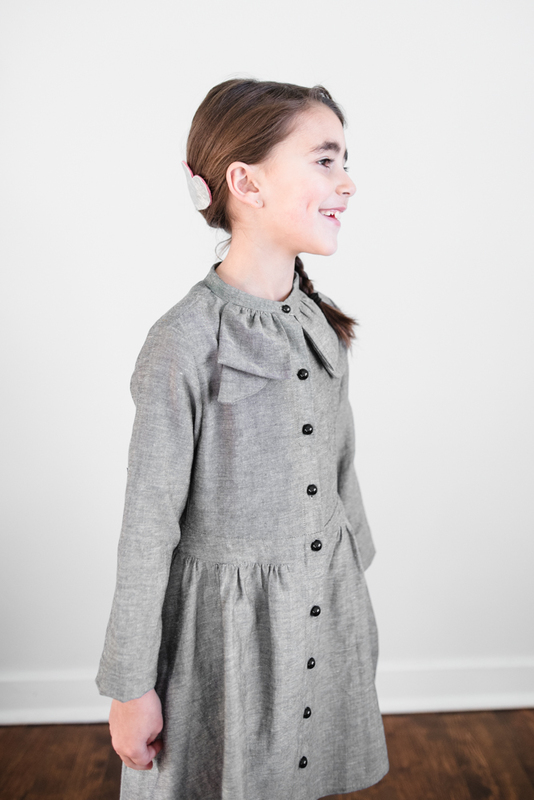 MissE wanted an Amelie Poulain dress, it's one of our favourite movies. I just need to make her a red cardigan to complete the look. The fabric is a light weight cotton/rayon blend I think. I thrifted this polka dot fabric a while ago. It has a soft hand and drapes beautifully. The collar is a thin denim, I like that it is more stiff. The pattern comes with plenty of instructions and guides you through every step. 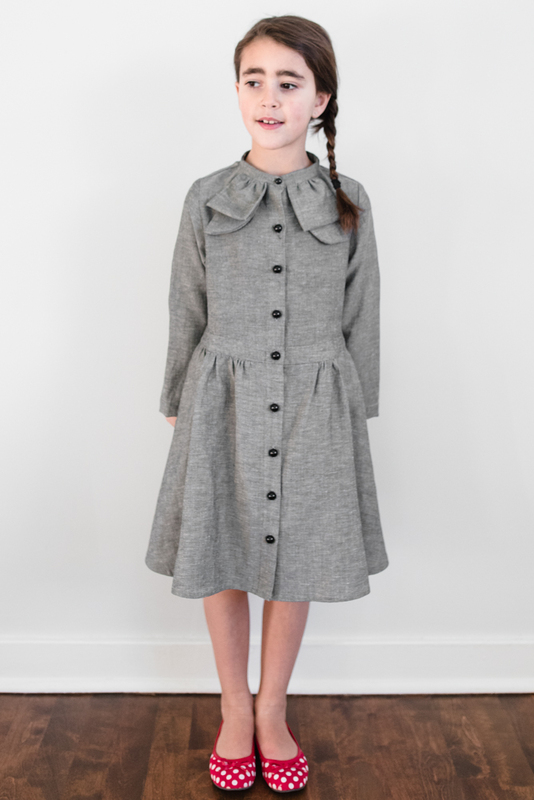 The grey dress, is a little dressier with the ruffle bow and Madarin collar. MissE loves the side seam pocket and the twirliness of this dress. She is so excited that it is her Christmas dress. The fabric is also thrifted. I would say it's also a blend. It has the hand of a lightweight linen but not the crispness. Maybe a cotton and polyester mix. I forgot to buy buttons for this dress and really wanted to get some cam snaps, so I could cover them with the same fabric. Since I am always last minute, I looked through my vintage stash and found a set of these. I like the contrast of the back with grey. It isn't something I would have intentionally done, but it worked out nicely in the end. You can add some elastic at the hem of the sleeves to give it a little more feminine touch. MissE must have grown between the time I made this dress and the photos, because I could have sworn the sleeves were not too short when I tried it on for fit. Luckily the hem is wide enough I could make them longer ( like that will ever happen! hehe). You can get your copy of the Friday Dress this week on UPCRAFT. It's 25%off today only. It will be available in the shop here as of Monday. If you end up making a dress or anything petit a petit related, I would love to see it. Use #petitapetitpatters on Instagram. You can see the first Friday Dress ever here, another version I made here and a hacked version here too. I leave you with a MissE doing the shimmy! Happy Sewing!